Whether you’re planning a road trip to a particular destination like one of Long Island’s beautiful beaches or simply making your way through the Island, why not also check out some of the best roadside attractions! From the quirky to the scenic, some of Long Island’s roadside attractions make a great photo op or an experience in itself with the family. Many of these roadside attractions are also a great place to take a break from a long drive, so step out of the car and get some fresh air and may be even go for some good food to re-energize before continuing on the path to your end-destination. 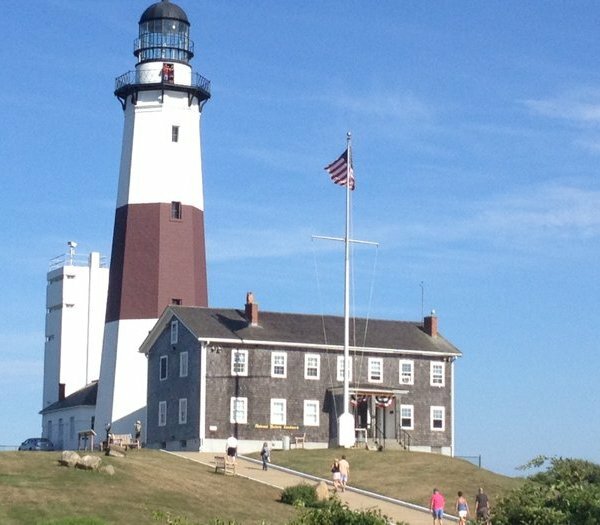 For some of the best roadside attractions on Long Island that appear along routes or that require just a small detour off an exit, you’ll want to head to these spots! Sitting on the western half of Long Island, find roadside attractions that give you a glimpse back at history. This statue of a Native American in full head gear stands between the Massapequa Post Office and the Big Chief Lewis building. He is also accompanied by a horse, buffalo, and a totem pole that are dwarfed by his approximate 12 feet tall size. According to popular legend, if you touch the totem pole and make a wish, it may come true, however, they now all sit behind a barbed wire-top fence for viewing only. This isn’t any ordinary restaurant drive-up! If you want to experience a classic American hamburger drive-in joint, you can find it here. And right next door is dessert at Marshall’s Ice Cream Bar. Take step back to the 19th century! This spot features a living history museum. On this 209-acre plot of land sits the view of history on how homes, farms and businesses operated during that time. In 2007, it also opened a Restoration Farm where produce is grown and made available for sale to the public. Get a welcome to Oyster Bay with the statue of President Theodore Roosevelt as rough rider. It was cast from the original 1922 mold created by sculptor Alexander Phimister Proctor. President Roosevelt’s historic family home is also nearby and open to the public as a national historic site. Make a visit to the last remaining sand mine shaft. Built atop the mine shaft is the Sand Miners Monument depicting three life-size sand miners watching a pair of disembodied hands pour sand in a pile that forms a miniaturized New York City. The monument is dedicated to the miners who worked the local sandbanks to allow the creation of New York City’s skyline. Sitting on the eastern half of Long Island, find roadside attractions including the odd, quirky to memorials. You don't want to miss this landmark site on the barrier island off the southern coast of Long Island! The lighthouse stands 180-ft tall. Entering this place for a wide variety of seafood can appear like you’re being eaten by its Shark Mouth door entrance. 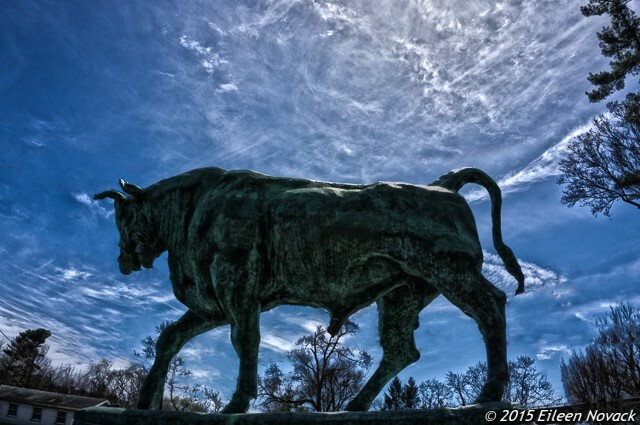 This 14-ft. tall bronze bull weighing 5 tons was presented to the people of Smithtown on May 10, 1941 by Mary Rumsey, the daugther of Charles Cary Rumsey, the man who sculpted the completed piece in 1923. Just like its name, that is what you can expect to see at this National Landmark built in 1931 by a duck farmer named Martin Maurer. You don’t have to fear you’ll miss it because this structure stands 20 feet tall in the shape of a duck. The duck structure was originally built to serve as a place to sell farm raised Peking ducks, but today, it is open year-round as a tourist destination and gift shop featuring duck souvenirs and holiday lights come December. There’s also an annual holiday lighting of the Big Duck usually on the first Wednesday of December that’s sponsored by the Suffolk County Parks Department. A view of the restaurant’s exterior will have you wondering if you’re still on Long Island. This family owned and operated Italian restaurant features 12-foot tall dueling musketeers, a castle, and mythological characters like a unicorn at the exterior. The sight gives a look back at the 18th century. Visit the park that pays tribute to those who’ve made advances in aviation and aerospace from Long Island. It’s dedicated to a group of employees of Grumman Corporation that took aviation from the flight deck of a Navy carrier to man’s first step on the moon. Find aviation artifacts, including the F-14A Tomcat built by Grumman. This isn’t just the place of a quarter-mile oval race track with a Figure 8 course, but it’s also home to an Indian Chief Muffler Man that stand watch over the raceway. The figure has also appeared on an episode of the Sopranos. If you’re wondering what’s to see at a post office, at this location in Stony Brook, you can catch the wings of a mechanical eagle flap. It flaps on the hour, between 8 a.m. and 8 p.m., at the exterior of the building. It’s been going since 1941. Going here is like reaching the highest elevation point on Long Island, which makes it an especially appropriate location as a memorial to the brave individuals who served in the Vietnam War. Sitting at the location is a 100-foot tall obelisk. The tip of the structure is dressed in the colors of the United States flag. Sitting at the most eastern tip of Suffolk County – the East End, find roadside attractions that offer stunning views. Enjoy a breathtaking view up this 137-step lighthouse! This lighthouse was commissioned by President George Washington in 1792 and is the oldest lighthouse in New York State. It’s also designated a National Historic Landmark. In addition to serving as an active aid to navigation at sea, it is also frequently used to host weddings and special events. Those who have visited the Hamptons likely have come across an odd 70 foot steel plywood structure depicting a deer gazing up at the sky. Its ginormous size you can’t miss – making it an unofficial symbol many associate with as a welcome mark to the Hamptons. The structure was created by Linda Scott and was commissioned by the Animal Rescue Fund as a proposed entrance. The finished structure was never put to work as intended because it was forbidden by the Town due to its size. The structure was left without a home until a farmer agreed to have the structure lay on the grounds of his sod farm, which is exactly at the side of the road at the entrance of the Hamptons. For the best view, see it a sunset. Don't see your favorite roadside attraction listed? Let us know!